Boil (or microwave) sweet potatoes in their jackets until cooked (a thin knife should be able to go through easily). Put butter and sugar in a large bowl. Peel hot potatoes--with knife, cut top and peel down, removing any stringiness from the potato with the skin, cut bottoms. Place hot, peeled potatoes on the butter in the bowl with sugar, crush together. Add beaten eggs. Stir in spices (to taste). Pour into 2 unbaked pie crusts. 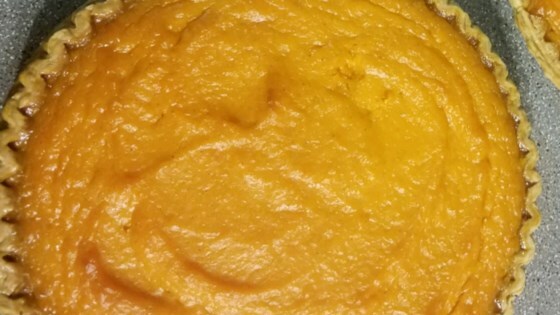 Should be the consistency of pumpkin pie mix. Bake at 350 degrees F (175 degrees C), for 45-55 minutes, until brown. Nancy the sweet potato pie was off the chain!!!! I was a little sketical about the amount of butter, but my husband said the pie was greaaattttt!!! Mmmmmmmm......I will never go back to pumpkin pie. I'm a sweet potato pie convert after this. Heaven in a pie shell.